The number of older adults living with diabetes is rising, and this population is at increased risk for serious complications and death. Exciting new technologies and products bring hope for improving care and management. According to the American Diabetes Association (ADA), diabetes disproportionately affects older adults.1 Already more than 25% of the US population aged 65 and older is living with this disease, and the number is expected to grow rapidly in the coming decades.2 This population has the highest rates of major lower extremity amputation, heart attack, visual impairment, and end-stage renal disease of any age group, and higher rates of premature death, disability, and cardiovascular disease than those without diabetes. 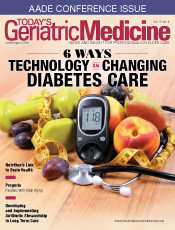 Older adults with diabetes also are at greater risk for issues such as polypharmacy, cognitive impairment, urinary incontinence, and falls.2 New tools for treatment and management like those described below could change the way diabetes impacts future generations, potentially decreasing the devastating toll this disease can take in later life. Hypoglycemia, or extremely low blood glucose, is a major concern for older adults with diabetes. Those aged 75 and older have twice the rate of emergency department visits for hypoglycemia of the general population with diabetes.2 "Members of the geriatric population with compromised kidney function or hypoglycemic unawareness may be more prone to hypoglycemia," says Eileen Sturner, RD, CDE, BC-ADM, MBA, manager of the Abington-Jefferson Health Diabetes Center and Nutrition Counseling Center in Abington, Pennsylvania. When an individual experiences an episode of severe low blood sugar, a glucagon injection is the only remedy. A bystander must prepare and inject the proper dosage during a crisis situation. In the not-so-distant future, managing a hypoglycemic crisis may be as easy as putting on a patch or puffing a powder. Similarly, apps can be useful to those already living with the disease. "For the smartphone-savvy population, some apps could help with management," Sturner says. "It's great to be able to see trends." There are a number of apps already available that allow users to record blood glucose readings, medications, food, and activity, with features designed to make it easier to spot trends and areas for improvement or change. The newest of these apps seek ways to streamline diabetes management even further. Meters aren't the only products taking advantage of wireless technology. In May 2015, Companion Medical received significant funding from Eli Lilly to bring to market an insulin pen (a dosing and injection system) with a built-in computer.8 The Bluetooth-enabled InPen and its associated smartphone app will help calculate the appropriate dose, track doses and administration times, and even indicate how much insulin remains active in the body from the last dose. The InPen will be able to send alerts and reminders about missed doses.9 "For people to be able to have all of this information at their fingertips could help with management," Sturner says. The ultimate solution to diabetes would be to either prevent the pancreas from malfunctioning or provide a patient with a new pancreas. The possibility of people with insulin-dependent diabetes being able to produce their own insulin may actually be close to reality. In 2015, ViaCyte, Inc, a California company working in the emerging field of regenerative medicine, began testing beta cell replacement therapy in a group of people with diabetes.4 Two small strips are implanted under the skin of the subject's lower back.16 Inside these strips are pancreatic beta cell precursors. Once implanted, the beta cells are expected to mature into endocrine cells capable of excreting insulin and other hormones to control blood glucose levels. ViaCyte's hope is that these strips will protect the cells from triggering the body's immune system, while allowing in glucose and other nutrients and releasing insulin and other hormones as necessary.17 If all goes well, perhaps all of the other innovations mentioned in this article will become unnecessary in the future. Recognizing that older adults living with diabetes have unique issues that have not been adequately addressed in research and recommendations, the ADA's 2016 Standards of Medical Care in Diabetes include a new and more comprehensive section on diabetes care in older adult populations.2 The recommendations, covering issues such as neurocognitive function, hypoglycemia, treatment goals, care in skilled nursing facilities/nursing homes, and end-of-life considerations, underscore the need for a comprehensive patient-centered team approach to care.2 "Even with these technologies," Sturner says, "diabetes care needs the human touch. The patient is the center of the team, but needs that team to customize the approach to care, educate, ensure proficiency, and support the use of technology." Sturner cautions that as exciting as these innovations are, technology is only as good as the person using it. "If technology allows better control with increased safety, that's a great thing," Sturner says. "But it's important users are educated on the correct use of these technologies." The aging of the US population is one of the drivers of the diabetes epidemic. This disease shortens lives, decreases functional status, and increases the risk of institutionalization for older patients.1 But management that improves blood glucose control can reduce the long-term consequences such as amputations, loss of vision, kidney failure, heart disease, and nerve damage often seen in older adults who have been living with diabetes. While the innovations mentioned in this article will not cure diabetes, they will hopefully ensure that future generations live longer, healthier, and easier lives. As Sturner says, "Our goal in working with older adults is to increase not only the quantity of their days but [also] the quality of those days." 1. Older adults. American Diabetes Association website. http://www.diabetes.org/in-my-community/awareness-programs/older-adults/. Updated April 9, 2015. Accessed May 2016. 2. American Diabetes Association. Standards of Medical Care in Diabetes — 2016. Diabetes Care. 2016;39(Suppl 1):S1-112. 3. Zosano Pharma announces positive Phase 2 results for its ZP-Glucagon patch program for treatment of severe hypoglycemia. Zosano Pharma website. http://ir.zosanopharma.com/releasedetail.cfm?ReleaseID=936338. Published October 13, 2015. 4. Neithercott T. 12 products in the diabetes pipeline. Diabetes Forecast website. http://www.diabetesforecast.org/2016/mar-apr/12-products-in-diabetes-pipeline.html. Published March 2016. 5. Rickels MR, Ruedy KJ, Foster NC, et al. Intranasal glucagon for treatment of insulin-induced hypoglycemia in adults with type 1 diabetes: a randomized crossover noninferiority study. Diabetes Care. 2016;39(2):264-270. 8. Companion Medical announces completion of Series B financing. Companion Medical website. http://www.companion-medical.com/news.html. Published May 20, 2015. 9. Tenderich A. Companion's new smart insulin pen will mimic a pump. Healthline website. http://www.healthline.com/diabetesmine/companions-new-smart-insulin-pen-will-mimic-pump. Published July 28, 2015. 10. Hurley D. Priming the pump. Discover. May 2016. 13. BD and Medtronic collaborate to introduce a new infusion set with BD FlowSmart™ technology designed to improve insulin pump therapy. BD website. https://www.bd.com/press-details/20112/BD-and-Medtronic-Collaborate-to-Introduce-a-New-Infusion-Set-with--BD-FlowSmart™-Technology-Designed-to-Improve-Insulin-Pump-Therapy. Published June 8, 2015. 14. Medtronic to use GlucoSitter artificial pancreas software in future insulin pumps - a big deal! diaTribe website. http://diatribe.org/drugdevice-name/medtronic-minimed-640g#sthash.16MhYTBv.dpuf. Published April 6, 2015. 15. Russell SJ, El-Khatib FH, Sinha M, et al. Outpatient glycemic control with a bionic pancreas in type 1 diabetes. N Engl J Med. 2014;371(4):313-325. 16. Curry A. Beta cell breakthroughs. Diabetes Forecast website. http://www.diabetesforecast.org/2015/may-jun/beta-cell-breakthroughs.html. Published May 2015.